Here is our second LLLSalon night! Our theme was Inspiration. Gennifer, Allie, Edmund, Keith, Candace and I talk about how inspiration is a lot of hard work and that you need to get out of the car every now and again. Historically a Salon is a intellectual gathering where the hostess gathers a group of interesting people together to discuss politics, literature, art, music and other topics of the day. It would last over a long dinner which included several courses. These salons attracted the intellectual elite and were meant to educate and amuse their guests. I always loved the idea of a good salon. People wielded power in salons. Each Lounging with LannaLee episode acts as if it were a mini-salon, with me and one or two guests. When I Lounged with Candace Karu I told her of my dream: to do a larger scale lounge. And to my great surprise and immense pleasure, she volunteer to host a dinner party at her house so we could do this. It's time for some inspiration for the new year. Here are three conversations that inspire me. Steve, a conservation biologist, and I talk about how he helps his students tell stories about ecology and he tells a story of how he came to collaborate/help start the Ghana Antelope Project. TLOVE and I talk about poetry, and she performs my favorite of her poems. And Rob Gould (@bobbbyg) answers 10 questions like nobody's business. Steve lounged with LannaLee in LLL024 Steve Trombulak: Hug The Earth Hard Enough. 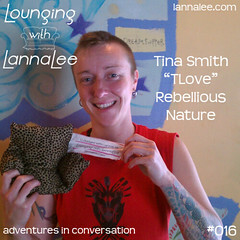 TLOVE lounged with LannaLee in LLL016 Tina Smith, "TLOVE": Rebellious Nature. Rob Lounged with LannaLee in LLL020 Rob Gould: Change Like you Mean it. Mya Achmatowicz wants to never grow up. The night before the new year, Mya and Lanna sit down to chat about writing, books and movies. Mya gives her reasons for a career in writing and explains why she's sticking with the traditional publishing route. And she answers 10 questions. Mya is an author of young adult fantasy, the darker and twistier the better. She grew up in the wilds of Michigan and Maine, which is probably why even her love stories are full of blood. Her chief vices are coffee, books, and The Vampire Diaries, with a side of Gossip Girl.